It’s really much better than it sounds. 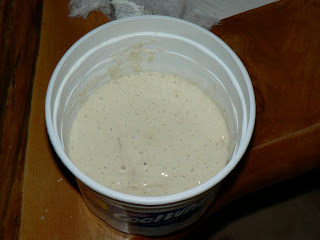 Unable to control myself, I decided to peek in on my starter dough. To my surprise, it had doubled in bulk and had become all bubbly and frothy! Nice. The smell still isn’t too sour or anything, but everything I have read suggests that the flavor is not fully matured until a couple of weeks have passed. 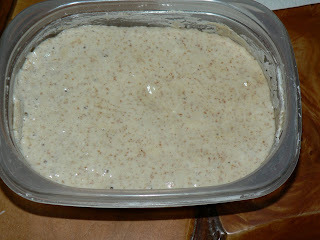 Since this was a marked improvement in the sourdough process, I snagged my bro’s camera and took a few pictures. I tried to get a closer shot, but i couldn’t figure out how to focus. But even from this distance you can see the many tiny bubbles that have formed. Definitely a colony of feeding and active yeast. Again, in this you can see the bubbles. The slightly “off” color you see in this is just created by the use of wheat flour. What you are unable to see (due to my own lack of foresight) is the increased bulk of the starters. Simply put, they have doubled in size. So, there you have it. It only took a record setting 24 hours to catch and foster a colony of wild yeast. Now I plan to continue to feed them, leaving them out, until Saturday night, at which time I will mix up my sponge: the next step in making sour dough bread. The flavor won’t be as pronounced as it will be later in the life of the colony, but I still plan on making this preliminary loaf. Once I have proofed the sponge, I have to separate some of it back into a container to save the wild yeast I have caught. I plan to refrigerate that bit, feeding it once a week to keep it alive.